During the late eighteenth century scientists began to understand and experiment with the nature of gases. Joseph Priestly singled out nitrous oxide and some of its effects. A young surgeon, Humphrey Davy, controlled the administration of nitrous oxide as a recreational drug at the Pneumatic Institute. The British upper classes were willing to pay for “laughing gas” parties, starting in 1799. Though Davy noticed it had seemed to dull a toothache, nearly half a century passed before the anesthetic qualities of nitrous oxide gas were taken seriously. In 1844 an up and coming young dentist and inventor, Horace G. Wells, took his wife to see a demonstration of laughing gas given by Gardner Colton, a showman and former medical student. While demonstrating the gas for amusement a volunteer bumped his shin, but was imperceptive to the pain. The mid-nineteenth centuries had brought changes in the American diet. More sugar and refined treats caused more tooth decay and the need for extractions increased. Concerned about the comfort of his patients, Wells hoped nitrous oxide would bring an end to pain during oral surgery. He was even willing to try the gas on himself. Colton administered the gas while another dentist extracted one of Wells’ molars. 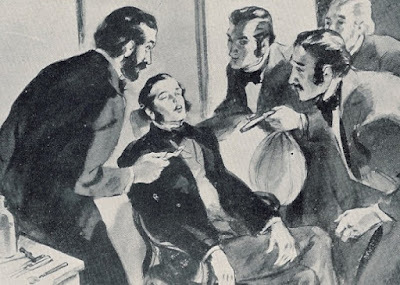 Impressed with the success of the painless extraction, Wells went on to perform several procedures while his patients were under the influence of nitrous vapors. Enthusiastic about his outcomes, Wells attempted to demonstrate painless dentistry early in 1845, at Massachusetts General Hospital. Probably due to improper titration, the patient likely didn’t receive a sufficient amount of the anesthesia. Their cry of pain during the procedure brought an end to the demonstration. Wells lost his credibility and was greatly discouraged, though he continued to practice painless dentistry. While one of his former partners went on to promote ether as a an adequate anesthetic for dental surgeries, Wells decided to go to New York and further promote himself in the field of anesthesia. Having gone ahead of his family so as to establish himself in the city, he found himself lonely and depressed. He began using ether and chloroform to ease his emotional pain, becoming intoxicated by the drugs. In his confused mental state, Wells ran out to the street and threw acid on two women. Only their clothes were damaged in the attack, but Wells was arrested and subsequently imprisoned for his violent act. Despondent about the shame he’d brought on his family and himself, at the age of 33, while jailed, he took his own life. He is buried next to his wife in his hometown of Hartford, Connecticut, and his tombstone hails him as the “discoverer of anesthesia”. Kathleen Rouser, CDA, RDA has been a mild mannered dental assistant during her post homeschooling mom life and is all for painless dentistry. Her debut novella, The Pocket Watch, is part of Brave New Century, a Christian historical romance anthology, published in 2013. Her short story, “Special Assignment” was included in the 2014 bestselling anthology, Christmas Treasures. Her first full-length novel, Rumors and Promises, will be published in April, 2016 by Lighthouse Publishing of the Carolinas. She has had several magazine articles published and also contributes regularly to Novel PASTimes, a blog devoted to promoting mainly Christian historical fiction. She is a long time member in good standing of ACFW and a former board member of its Great Lakes Chapter. Thank you, Kathleen, for sharing this very interesting post. I am certainly all for painless dentistry!!! You're welcome. I find it interesting to learn how some of the things we take for granted these days came about. The beginnings of painless dentistry certainly came at a price for Dr. Wells! Most dentists say veneers should last up to 10 years. This dentist Redondo Beach did mine 20 years ago and they are still good. I would not go to any other dentist.